This is the emissions vacuum line diagram for the 22R-E engine. This particular year, 1984, has slightly different components than previous years, but is also not quite the fully redesigned 22R-E of later years, which have only three ports on the intake body. 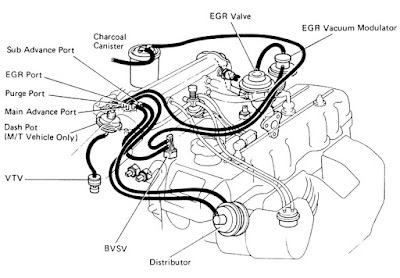 One easy way to tell is the 1984 model has only one bimetallic vacuum switching valve (BVSV), located on the intake manifold under a coolant hose. Earlier years have two BVSV valves. The vacuum transmitting valve (VTV) is likely the same flow rate as previous valves, that is type BROWN (400 cc/min). It opens to atmosphere.